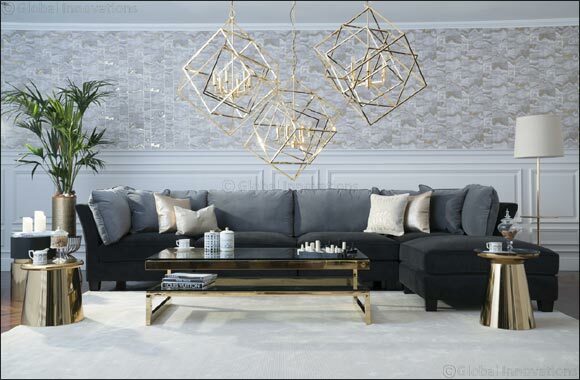 Dubai, UAE; 03 September, 2018: 2XL Furniture and Home D�cor, the leading luxury furniture and home accessories brand in the UAE, has launched their Hemlock corner sofa set in dark grey for modern living rooms. Hemlock corner sofa is both stylish and flexible. The polyester fabric and foam of the sofa makes for a comfortable seating experience. You can add the Hemlock ottoman to add more seating options. To create a more vibrant atmosphere, colorful cushions would be a great choice. The color of the sofa is very basic and goes very well with any wall color or wallpaper. Joining side tables is never a bad choice, Dion and Desi golden side tables from 2XL will perfectly match with Hemlock dark grey sofa set. One can accessorize the tables with candles, flowers or even cookie jars. To glam up the room, add the matching Beatrix center table from 2XL. It is a perfect choice for living rooms when there are large gatherings, it allows sufficient space to place cups and dishes and is stylish and modern. To brighten up the whole room, one can also add golden chandeliers from 2XL. Hemlock corner sofa set is available for AED 7,797 and Hemlock ottoman is available for AED 1,197. Desi and Dion side tables are available for AED 661 each. The Beatrix center table is available for AED 1,853. Apart from the new collections in store, 2XL is giving customers a chance to win100 Swiss bars every week. 10 lucky winners who purchase AED 2500 or more from 2XL branches in the UAE, in the month of September, are eligible for the draw.